शृंखला की आम तौर पर प्रशंसा उसकी एक प्रकार की मध्ययुगीन यथार्थता के लिए की जाती है। जॉर्ज आर आर मार्टिन ने इस कहानी को समकालीन फंतासी की तुलना में ऐतिहासिक फिक्शन की तरह महसूस कराने के लिए प्रयास किया, व साथ ही जादू और टोना पर कम जोर दिया और लड़ाई, राजनीतिक साजिश और पात्रों पर अधिक जोर दिया, यह विश्वास करते हुए कि जादू का महाकाव्य काल्पनिक विधा में मामूली इस्तेमाल किया जाना चाहिए। मार्टिन ने कहा है कि "मानव इतिहास की सच्ची भयावहता ऑर्क्स और डार्क लॉर्ड्स से नहीं बल्कि खुद से व्युत्पन्न होती हैं।"
यद्यपि पहला सत्र पहले उपन्यास की घटनाओं का पालन करता है, बाद के सत्र में महत्वपूर्ण बदलाव किये गएँ हैं। डेविड बेनिऑफ के अनुसार, यह कार्यक्रम "पूरी तरह से शृंखला का अनुकूलन करने और जॉर्ज द्वारा बिछाए गए नक्शे का पालन करने और प्रमुख मील के पत्थरों को छूने के बारे में है, लेकिन जरूरी नहीं कि रास्ते में आये प्रत्येक स्टॉप को छूने के बारे में हैं।"
Season	Episode number	Average 1	2	3	4	5	6	7	8	9	10 1	2.22	2.20	2.44	2.45	2.58	2.44	2.40	2.72	2.66	3.04	2.52 2	3.86	3.76	3.77	3.65	3.90	3.88	3.69	3.86	3.38	4.20	3.80 3	4.37	4.27	4.72	4.87	5.35	5.50	4.84	5.13	5.22	5.39	4.97 4	6.64	6.31	6.59	6.95	7.16	6.40	7.20	7.17	6.95	7.09	6.84 5	8.00	6.81	6.71	6.82	6.56	6.24	5.40	7.01	7.14	8.11	6.88 6	7.94	7.29	7.28	7.82	7.89	6.71	7.80	7.60	7.66	8.89	7.69 7	10.11	9.27	9.25	10.17	10.72	10.24	12.07	N/A	10.26 Audience measurement performed by Nielsen Media Research. ↑ Roberts, Josh (April 1, 2012). "Where HBO's hit 'Game of Thrones' was filmed". USA Today. अभिगमन तिथि March 8, 2013. ↑ Schwartz, Terri (January 28, 2013). "'Game of Thrones' casts a bear and shoots in Los Angeles for major Season 3 scene". Zap2it. अभिगमन तिथि March 8, 2013. ↑ Jeremy, Nolais (May 14, 2015). "Game of Thrones casts Calgary wolf with Jon Snow". MetroNews.ca. अभिगमन तिथि July 18, 2015. ↑ Roots, Kimberly (January 7, 2016). "Game of Thrones Season 6 Premiere Date Revealed". TVLine. अभिगमन तिथि January 7, 2016. ↑ Fleming, Michael (January 16, 2007). "HBO turns 'Fire' into fantasy series". Variety. मूल से May 16, 2012 को पुरालेखित. अभिगमन तिथि March 2, 2010. ↑ Cogman, Bryan (November 6, 2014). Inside HBO's Game of Thrones. Orion. पृ॰ 4. आई॰ऍस॰बी॰ऍन॰ 978-1-4732-1040-0. मूल से November 6, 2016 को पुरालेखित. अभिगमन तिथि November 6, 2016. ↑ Martin, George R. R. (July 16, 2010). "From HBO". Not a Blog. मूल से March 7, 2016 को पुरालेखित. अभिगमन तिथि March 14, 2013. ↑ Orr, David (August 12, 2011). "Dragons Ascendant: George R. R. Martin and the Rise of Fantasy". The New York Times. मूल से March 28, 2013 को पुरालेखित. अभिगमन तिथि August 22, 2016. ↑ Richards, Linda (January 2001). "January interview: George R.R. Martin". January Magazine. मूल से April 4, 2012 को पुरालेखित. अभिगमन तिथि August 22, 2016. ↑ Itzkoff, Dave (April 1, 2011). "His Beautiful Dark Twisted Fantasy: George R. R. Martin Talks Game of Thrones". The New York Times. मूल से April 2, 2011 को पुरालेखित. अभिगमन तिथि August 22, 2016. ↑ अ आ Cogman, Bryan (November 6, 2014). Inside HBO's Game of Thrones. Orion. पृ॰ 7. आई॰ऍस॰बी॰ऍन॰ 978-1-4732-1040-0. मूल से November 6, 2016 को पुरालेखित. अभिगमन तिथि November 6, 2016. ↑ Gevers, Nick (December 2000). "Sunsets of High Renown – An Interview with George R. R. Martin". Infinity Plus. मूल से April 4, 2012 को पुरालेखित. अभिगमन तिथि August 22, 2016. ↑ "The battle between good and evil reigns – Martin talks about new series Game of Thrones". The Guardian. June 11, 2011. मूल से April 2, 2016 को पुरालेखित. अभिगमन तिथि August 22, 2016. ↑ Baum, Michele Dula (April 11, 2001). "A Song of Ice and Fire – Author George R.R. Martin's fantastic kingdoms". CNN. मूल से April 4, 2012 को पुरालेखित. अभिगमन तिथि August 22, 2016. ↑ अ आ Fowler, Matt (August 27, 2017). "Game of Thrones: "The Dragon and the Wolf" Review". IGN. अभिगमन तिथि August 28, 2017. ↑ Kirschling, Gregory (November 27, 2007). "George R.R. Martin answers your questions". Entertainment Weekly. मूल से April 4, 2012 को पुरालेखित. अभिगमन तिथि August 22, 2016. ↑ Boulaziz, Louisa (September 13, 2016). "Game of Thrones is realistic". Universitas. मूल से March 20, 2017 को पुरालेखित. अभिगमन तिथि May 30, 2017. ↑ Hibberd, James (March 17, 2015). "Game of Thrones showrunners answer burning season 5 questions". एंटरटेनमेंट वीकली. मूल से April 30, 2016 को पुरालेखित. अभिगमन तिथि March 18, 2015. ↑ Hibberd, James (May 29, 2012). 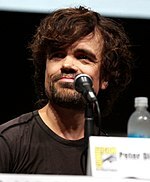 "'Game of Thrones' scoop: Season 3 character list revealed – EXCLUSIVE". Entertainment Weekly. मूल से January 5, 2015 को पुरालेखित. अभिगमन तिथि March 5, 2013. ↑ "Season 3: by the Numbers". Making Game of Thrones. November 2, 2012. मूल से March 6, 2013 को पुरालेखित. अभिगमन तिथि November 3, 2012. ↑ Belloni, Matthew; Goldberg, Lesley (October 30, 2014). "'Game of Thrones' Cast Signs for Season 7 with Big Raises". The Hollywood Reporter. मूल से August 13, 2016 को पुरालेखित. अभिगमन तिथि October 31, 2014. ↑ Parker, Mike (April 25, 2017). "Game Of Thrones season 7: Stars set to earn £2 Million per episode". Daily Express. मूल से April 25, 2017 को पुरालेखित. अभिगमन तिथि April 25, 2017. ↑ Hooton, Christopher (April 25, 2017). "Game of Thrones season 7: Actors 'set to earn £2million per episode', making them highest-paid ever". The Independent. मूल से April 25, 2017 को पुरालेखित. अभिगमन तिथि April 25, 2017. ↑ अ आ इ ई उ "Game of Thrones: Cast". HBO. मूल से September 1, 2016 को पुरालेखित. अभिगमन तिथि May 18, 2015.